We often have topics that come up where we’d like to add our opinion, or share our thoughts. Reading a blogpost isn’t always possible, so listen to the audio of our thoughts on industry trends within these podcasts and talk shows. If you’d like to follow us on SoundCloud, please do! 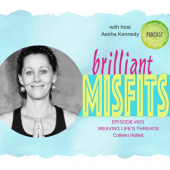 In this show, Colleen is interviewed by Aesha Kenedy for Brilliant Misfits. Hear about her journey to where she is now. Learn about her motivations and philosophy that lead to the creation of the woman-owned-and-operated Saliya Life Institute.